On Tuesday, New York hedge fund Paulson & Co, founded by noted gold bull John Paulson launched a blistering attack on the world’s top gold mining companies over “serial value destruction” in the industry. 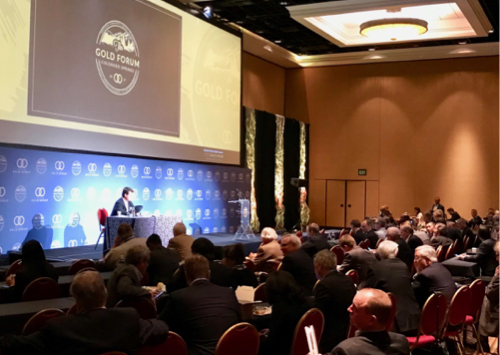 Speaking at the Denver Gold Forum, the sector’s most important gathering now in its 28th year, Paulson & Co partner Marcelo Kim called on major gold equity investors to join a coalition – dubbed the Shareholders Gold Council – to stop CEOs, boards and management enriching themselves at the expense of shareholders and prevent companies from embarking on the kind of acquisitions and budget blow-outs that according to Kim have destroyed $85 billion in value just since 2010. Kim said he was speaking with the full backing of Paulson (his fund holds over $500m in gold ETFs and a variety of gold mining stocks) and that Tocqueville, a fellow precious metals investment fund, had already endorsed the initiative. “If we don’t do anything to change, then as investors we will continually be disappointed with shareholder returns and the industry will slowly dig itself into a hole of irrelevance and oblivion,” Kim told a packed room of delegates while showing slide after damning slide detailing the industry’s “dreadful” performance. While the gold price has added 20% since 2010, average total shareholder returns from investments in the top 13 producers are a negative 65%. Over the same period the CEOs of these companies pocketed a collective $550 million in pay, Kim said. Canadian miner Eldorado Gold came in for the most severe criticism for destroying value through ill-advised acquisitions (the most recent last year), but Kim also highlighted Randgold Resources as an example of how disciplined strategy can create value for shareholders. The Africa-focused miner and Russia’s Polymetal were the only companies to beat bullion’s performance to end-2016 and Kim pointed to the irony that the latter’s CEO was by far paid the least while Eldorado’s boss had raked in $65 million since 2010. While the presentation did not look at small and mid-tier companies, Kim said he suspects that the same trends are visible among juniors.